Curious to know what you say about luck. « [Video] Statistics and Numbers, which matters! Hmmmm… I believe in in one thing, all we are doing home, in work, in bed, everywhere, influences other people. Maybe our activity is conditional by some invisible forces or power…I dont know. The same question is: “if we believe in fate?” I dont know, have we so much time to thinking about it? Life is so short to come up with result. 😉 thank u for comment Bro. i agree with you that only thing we can change is how we behave, act and think right now and that shapes our future. so getting prepared is by total dedication and doing work you love. Well… I personally believe in luck. Because if you sit down in a quiet corner, close your eyes for a while and think about the past, you will get to know that your life is full of the incidents that were purely because of your luck. But at the same time i do believe that you can shape your luck in a good way but you cant measure how much good is it. It all depends on your outlook. Research was done into people who classed themselves as “Lucky” vs those who were “unlucky”. The “lucky” ones had a positive outlook. e.g. “I was unlucky because I just had a car crash” vs “I was lucky because I just had a car crash and walked away from it alive”. I try to have a positive outlook, so should get better luck! I like that you too try to look at things from brighter side, there is always something positive out of every situation which happens to us, if we seek to see it. I believe that what doesn’t kill us, makes us stronger. Have a wonderful 1st spring working week ahead! Ah, I don’t believe in luck – the universe is too smart for that ! Mars, have you read book by Joseph Jaworski – Synchronicity? It is one of my fav books! … And I want to add something more to this. What is luck for me. Luck don’t come to people waiting for it to show up sometime while sitting aimlessly. I count luck when, while doing something, while striking your best, while putting in all efforts in something you want to achieve you come across some opportunity! Now opportunity came in by Luck but it came in because you were working hard to get to your destination. You might have noticed that while doing something you come across hurdles and brick walls where you have to work over hard to get ahead. Well those brick walls are not for the people who want to achieve something. Those hurdles and brick walls are perhaps the dividing line to filter out the people who don’t want to go ahead. And I believe there is an opportunity behind every brick wall and hurdle! So when you get that opportunity after overcoming the hurdle, people will see you as LUCKY! what a great compilation of thoughts! WOW! Thank you for sharing it with us. It is such a pleasure to witness how you are overcoming hurdles and brick walls on your journey! With heart and passion and true dedication. I am proud and LUCKY to have friend like you. And, yes people give various names to those who have done something remarkable, something what they have never have guts to do themselves. Calling someone lucky is hiding their own frustrations of not being able to cope with hurdles. have agreat great day …..
😉 Sidra thank you for your rich comment. Yes, Steve’s commencement speech is memorable and inspiring for me as well, i know it almost by heart. Have a super cool rest of the day. Luck is just behind your efforts. In fact I am a great admirer of luck. Many times you get things done just because of your powerful intentions and determinations. If one do work with passion and follow what the INSIDE VOICE is then he/she get it. Early on, a friend shared a saying from his Dad with me, “Luck is when skill and opportunity come together.” And I believe it. Sure there’s dumb luck, but *luck* is a huge spectrum. What I found is that what a lot of people attribute to luck, is simply that they didn’t know how things work or they didn’t work on their anticipation skills to see ahead. Art and Science of Success. Thanks J.D., so true that real long lasting luck requires preparation, to be ready when opportunity will show up. I’d put that randomness is our own failure in knowing why something happened in a certain way. And luck is just the same but happening with some convenience involved (for the “affected” one). I don’t think that one have to be distracted much about luck. But I do find useful to think that lucky is an event that happened in a fortunate context that you can make or help to get built. Volunteers of any movement that cares about people have hard work designing and building those context while the people who get the benefits could call themselves lucky (which can feel frustrating for who paid the efforts). We should want to make customers to feel lucky of finding our service. That’s an interesting guide to do homework I think. is useful for making a difference to make someone to feel lucky about our product, service or movement? i would prefer to make feel customers special, rather than lucky. because as it was said before luck is very relative term. making difference by providing customers opportunity to FEEL special, so they will remember it (forever), how great they have felt when they came across our service/product. then. one day they might say: “I am really lucky to have such a great hairdresser, boss, ice cream shop, restaurant”…whatever it is. Yes I believe in luck every moment of us has connection with it, we can make or destroy it by our actions, luck is second name of hard work and our kind deeds, if someone is not serious and kind in his deeds he cant achieve it. So if we believe in us and think that we are doing great in our life we’ll get it. happy to visit your blog,cheers. 1. we fail, it is important not to automatically assume we are bad at what we just failed at, or that we are not working hard enough. As an example, the London Times sent famous books to agents and publishers under incognito names, and they were rejected. What is important is persistence, and unwillingless to give up. 2. we succeed, it is important not to think we are better, smarter, or more able than others around us. We must acknowledge the role that randomness and circumstance plays in life and not develop a superiority complex. I recommend “The Drunkard’s Walk” by Leonard Mlodinow. @2: staying focused and humble is characteristic we need to carry with us, all the time no matter what great things might happen to us. remain grateful and start new, like nothing happen, this will protect us from feeling superior. Ivana, that question is a tough one, but luckily (! ), also very easy to answer. Tough, because luck can be defined in so many ways, and might be overlapping with coincidence, synchronicity, etc., depending on one’s point of view. Easy, because I know it exists even when I can’t pin it down on the spot with my definition. I agree that it’s terrific when “lucky” moments are the result of hard work – but that’s not a prerequisite for me. 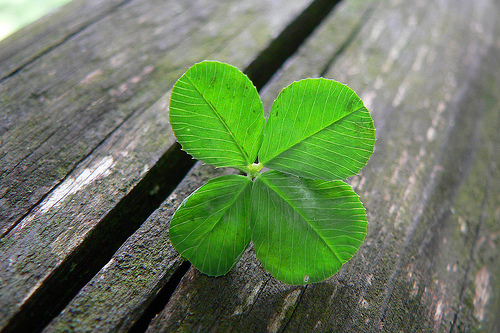 It’s the right state of mind: If you are not open towards accepting your luck, it just won’t be there. If you are certain that nothing good can possibly come out of your current situation, then nothing will. Don’t get me wrong, I don’t mean one has to be the smiling optimist all the time – but there must be at least a sparkle in your mind, a little resilient part of your brain that looks at the unexpected situation and _sees_ the luck in it. In that regard, I guess, I follow Kennie’s line of argument – luck in the circumstance, not the achievement. i am inclining to being optimist all the time. I’m loving the conversation going on.